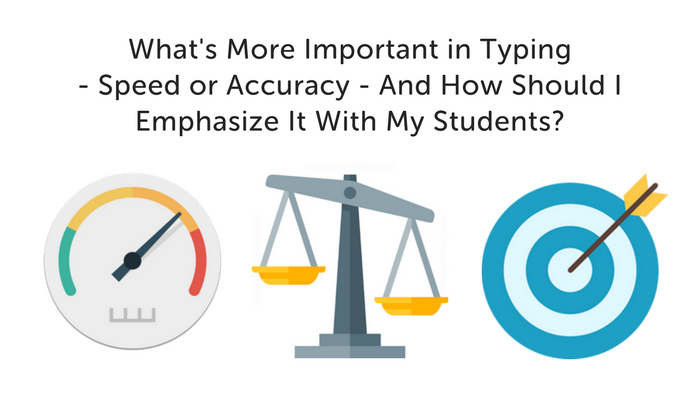 What's More Important in Typing - Speed or Accuracy - And How Should I Emphasize It With My Students? Imagine there is a baseball player who can pitch the ball at 150 miles per hour, breaking the world record. In a game, though, he only throws a strike one out of every ten pitches. On the other hand, you have another pitcher who throws at 90 miles per hour, which is fast but not record-breaking. This pitcher throws strikes 99% of the time. Which pitcher would you rather put in if you were a coach? Obviously the pitcher with better accuracy! The bottom line? Speed matters, but accuracy matters more. This statement holds true for pitching, as well as typing. While both skills are an important part of being a proficient touch typist, for beginners, there is nothing more important than accuracy. While there’s no doubt that accuracy matters most for new typists, this truth often goes against the natural instincts of students. Many kids crave instant satisfaction and have a tendency for speed. As a teacher, it can be a challenge to slow kids down and help them internalize the importance of accuracy. A good place to start is by sharing the above baseball analogy. By putting speed vs. accuracy in a different context, you can help students see just how important accuracy is. Apart from just sharing this analogy, there are other ways you can show students that accuracy reigns king. An easy way to make this distinction is to grade students on each of these skills, with accuracy being a bigger part of their grade. Maybe accuracy on lessons and tests is worth 40% of a student’s typing grade while WPM is only worth 20%. This breakdown sends a clear message to kids that accuracy is most important, while also incentivizing them to slow down. Another good way to message the importance of accuracy to students is to set clear accuracy benchmarks. Depending on the age and typing experience of your students, you’ll want to set clear expectations of what constitutes acceptable accuracy. Sure, shooting for 100% accuracy might not be as enthralling as beating your top speed on NitroType, but there are things teachers can do to build excitement around accuracy. Find a time or space in your classroom to recognize those students who have shown performance or growth when it comes to accuracy. You can even reward students by giving them a raffle ticket or other small prize for every lesson they complete with 100% accuracy. You can also organize typing lessons in such a way that students need to complete a certain number of lessons meeting accuracy benchmarks before they can move on to a typing game. Regardless of how you spin it, teachers are responsible for helping students fight the urge to focus on speed, and make sure that accuracy doesn’t take the back seat. Have tips or ideas that you use in your classroom to incentivize typing accuracy? Share them in the comments below! Your analogy is a bit far fetched as no one has thrown a baseball 150 mph and 90 mph is a speed reached by very few pitchers. A more realistic comparison would be a pitcher that throws 95- 100 mph but rarely throws a strike (this person would not be a pitcher for long) and a pitcher that throws 65 – 70 mph with excellent strike to ball ratio. However, the second pitcher would be much easier to hit and may not be pitching for long either. I believe proficient touch typing can be attained by emphasizing speed or accuracy first. Work with the talent the student inherently has. The keys are not going to change places so natural speed should eventually find the correct letters. The anology was not supposed to meant to be real-world anology, the author was just trying to make it easier for kids to understand. while your anology is less far-fetched, maybe the author was just trying to make the anology… cooler. I’m am not trying to put you down, your anology is good. but this doesn’t mean you can be putting other people down just because it doesn’t make sense to you. think before you say things online. I created a brief PowerPoint on the most expensive typos mentioned on typing.com’s blog. Students were astonished by the consequences of not being accurate. What a great idea, Monica! You are right that maintaining typing speed with accuracy is most important. And I think for beginners, typing games are very helpful to gain typing speed.